On 15 April 1950 the Stephenson Locomotive Society 'London Junctions' railtour, apparently with the involvement of the Railway Correspondence & Travel Society, waits at Ludgate Hill before returning southwards. 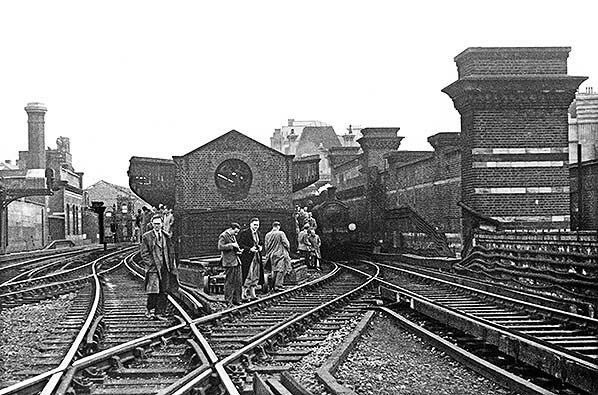 This tour was a short, two hour, gander around South London, commencing from Kensington Olympia (Addison Road until December 1946) and terminating at Victoria. The locomotive seen here worked the tour throughout and the stock was a six-coach set of which most, if not all, vehicles were in Carmine & Cream livery. The locomotive was C class 0-6-0 No.31716, built by Messrs. Sharp, Stewart & Co. in 1901 to a Wainwright design for the South Eastern & Chatham Railway. She was to remain in service until October 1961. The final class members in revenue service bowed out in July 1963 but three examples continued in use as Ashford Works shunters until 1966, among them being BR No.31592 which went on to enjoy a second life in preservation. 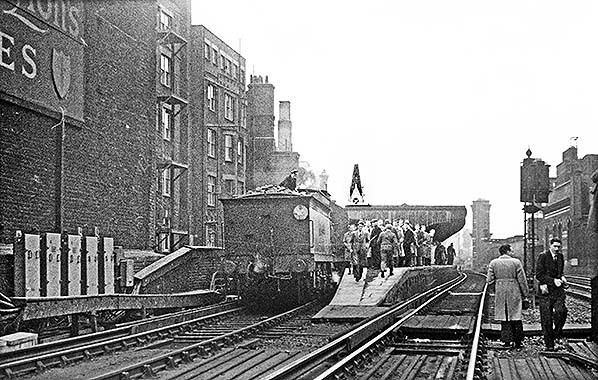 The 15 April 1950 was a Saturday and at this time service trains still operated to Holborn Viaduct on Saturdays, so the conductor rails through Ludgate Hill would have been live when the photograph was taken yet, as was commonplace during railtours at one time, the enthusiasts from the railtour are apparently oblivious to the potential danger. Due to the electrification schemes inherited by the Southern Railway, the third rail voltage varied according to area between 600 and 660VDC with 750VDC becoming the standard for mainline schemes from 1955. The line voltage through Ludgate Hill was 660V DC and as far as is known in 2018 still is. Note the wooden guards protecting the sides of the conductor rails; a common sight in locations where staff may have a need to walk or cross the tracks - presumably this added protection was deemed adequate for on-track enthusiasts back in 1950. A large number of railway enthusiasts gather on the south end of Ludgate Hill's island platform during a visit by the 'London Junctions' railtour on 15 April 1950. Again members of the public were allowed to step over the live rail using the staff boarded crossing at the end of the platform. On 15 April 1950 the Stephenson Locomotive Society 'London Junctions' railtour, waits at Ludgate Hill station while passengers disembark to take photographs. This was one of three scheduled stops on the tour arriving at 14.52 and departing at 15.06. The main stairway down to the booking office is seen in the centre of the platform. I wonder if any of the enthusiasts went down to the booking office; no pictures have come to light. 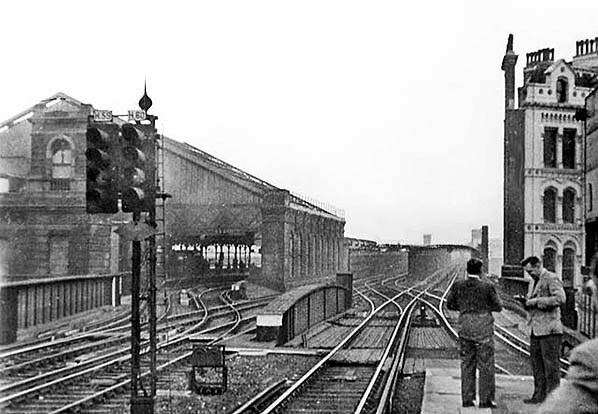 The view north from Ludgate Hill towards Holborn Viaduct station from the north end of Ludgate Hill platform in April 1950, with the low level (Snow Hill) lines partly visible on the left. The brickwork on the left is the top of the stairs down to the Pilgrim Street exit from the station, the white tiled wall can just be made out through the broken window. In the distance are two suburban EMUs, both being pre-war 4SUB types. By no means clear, even on a larger version of this picture, a few details can nonetheless be extracted. The unit on the left is one of the ex-L&SWR 'Torpedo' or 'Nutcracker' sets and is headcoded for the route to Sevenoaks via Nunhead and Orpington. The unit on the right is a little more difficult to identify but appears to be one of the 1925 sets, perhaps of ex-South Eastern stock. Its second vehicle is one of the steel panelled Bulleid trailers used to strengthen these originally three-car sets into what became 4SUB. The unit shows a 'Blank dot' headcode, which seems to have been an empty stock movement as a photograph exists showing one of these units passing through a carriage wash whilst showing this code. The building on the right bears the name 'Moore's Modern Methods Ltd.', a rather mysterious and somewhat tacky title which offers no hint as to the company's line of business. Now known as 'Moore's of London', they are still with us today and, now based at Elstree, are suppliers of office equipment and stationery to, in particular, governments both at home and abroad. 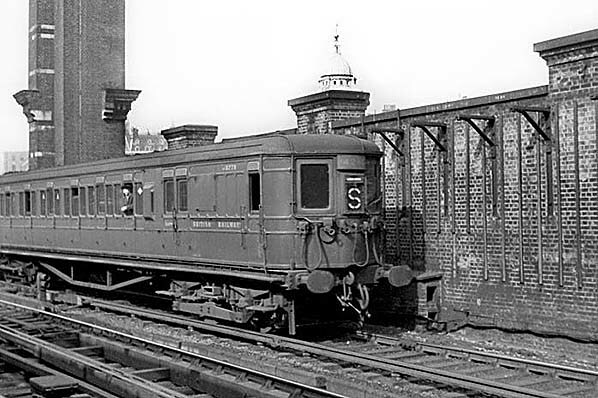 On 15 April 1950 a 4SUB EMU makes its way to Sevenoaks via Nunhead and Orpington, passing the wall which had once supported the overall roof of Ludgate Hill station. The pinnacle of The Old Bailey can be seen in the background. The EMU is of the type nicknamed 'Torpedos' due to the shape of the cab ends or, for some mysterious reason, 'Nutcrackers'. The vehicle seen is a Driving Motor Brake Third and, despite part of the vehicle being out of the picture, appears to be a six-compartment, 57ft example. Of L&SWR origin, the unit began life as a three-car set converted from hauled stock early in the second decade of the twentieth century. The reason for the coming into being of these L&SWR units in complex and revolves around fears of proposals by the Central London Railway (now the Central Line) to intrude into the South Western's suburban territory - plans which, history tells us, never came to fruition. Although the car number and unit number are both visible, neither can be discerned with any degree of certainty, although the unit number appears to begin with '42'. Certainly the first digit is a '4'; originally numbered in the 1xxx series, these units were later strengthened by the addition of a trailer; in some cases a matching vehicle or, from 1941, a steel-panelled Bulleid trailer. In four-car form the units were renumbered into the 4xxx series and became officially known as '4SUB'. In three-car form they came to be known as '3SUB' although this was apparently never official. From 1925 the Southern began to provide more of these units, with many being, again, conversions from hauled stock but this time from all constituent origins and these units could be distinguished by their flatter cab ends and, in some cases, wider bodies. A Driving Motor Brake Third, with 'Torpedo' end, has survived and resides at the National Railway Museum. The remainder of the pre-war units, which constituted just a part of what became the vast and varying 4SUB class, had all been withdrawn from passenger service by 1960 with many going in the 1953 - 5 period. On the waistline of the vehicle depicted the BRITISH RAILWAYS legend can be seen, which looked rather odd and somewhat severe applied to multiple unit stock. As with locomotives, it was an interim measure applied immediately after Nationalisation and ultimately replaced by the 'Cycling Lion' BTC/BR device which itself came to be replaced on passenger stock by the circular coaching stock device. 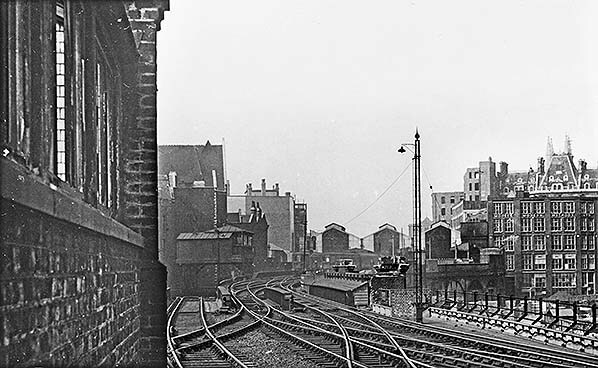 Looking north from the north end of Ludgate Hill station in the 1950s (probably taken during one of the two railtours, 1950 and 1953). The top of the stairs down to the Pilgrim Street exit are seen at the end of the platform. 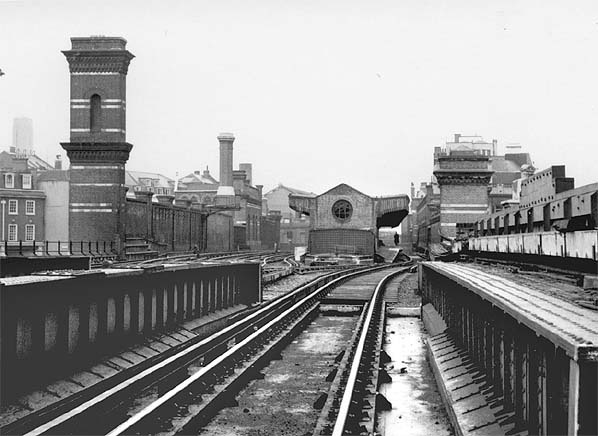 Holborn Viaduct signal box on a gantry above the line heading in to Snow Hill tunnel is seen in the middle distance with the Holborn Viaduct station trainshed further back. 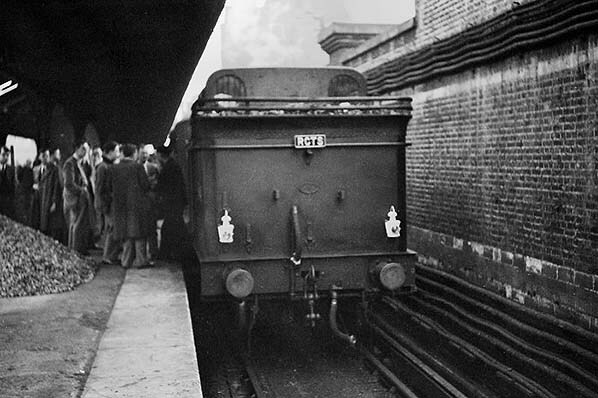 The RCTS (London Branch) 'Marylebone to Broad Street' railtour has stopped briefly at Ludgate Hill station on 10 October 1953 on its complex route, which included Battersea - Kentish Town via Blackfriars Bridge and the Snow Hill Tunnel (this was one of the few tours to continue north from Ludgate Hill), with ex-GNR N1 0-6-2T No.69441. The N1s were an H.A. Ivatt design for, mainly, suburban services from King's Cross and from the modern perspective have become arguably less well known than the Gresley N2s. Broadly externally similar, the most obvious difference was the flatter cab roof of the N1s - perhaps a throwback to Ivatt's predecessor Patrick Stirling. The heavy pipework on the side of the locomotive (one of two N1s to work this tour) was part of the condensing apparatus. 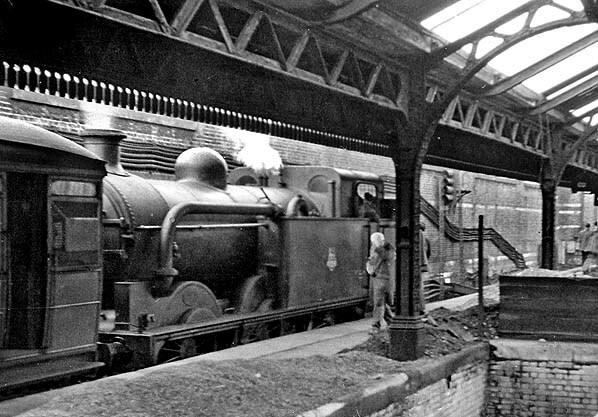 All bar four of the fifty-six strong class were so fitted, the other four being intended for the West Riding, and its purpose was to return exhaust steam to the water tanks. This reduced exhaust steam being emitted to the tunnels of the so-called 'Widened Lines' and also conserved water but it did not reduce smoke, which was emitted from the chimney in the normal way and control of this was largely down to the skill of the fireman. The main stairs up from the booking office are seen on the right. Another view of N1 69411 during the RCTS 'Marylebone to Broad Street' railtour on 10 October 1953. From around the time of The Grouping (1923) the N1s were being superseded by the N2s and most if not all the N1s moved north, primarily to the West Riding. At the time she was photographed No.69441 was allocated to Hornsey and would move north to Colwick six months later before moving to Bradford Hammerton Street the following year. Her stay at Bradford was, however, short as she was withdrawn from there in April 1955 and the class became extinct in April 1959. 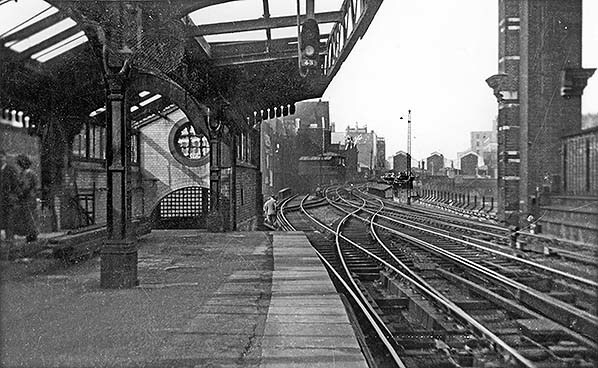 The view from the south end of Ludgate Hill station platform looking south during the RCTS 'Marylebone to Broad Street' railtour on 10 October 1953. 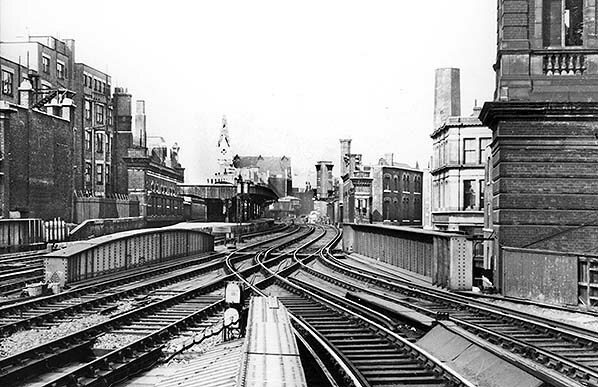 Blackfriars station is seen on the left with a staff walkway between the two stations. 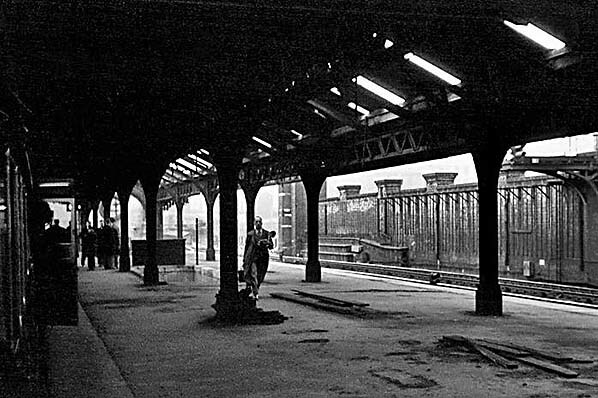 In 1959 Ludgate Hill station remained largely intact although a little shabby 30 years after closure to passengers. The large circular window provided light at the top of the stairs down to Pilgrim Street.